When people begin to manage money, they tend to now grasp what they have, often times they aren’t even sure what to do with all of it. Money runs society, and it baffles social scientists who are attempting to figure out how people think and how they feel. People often don’t do what years of history, research and theories say they should do. There is an economic theory that is based on people that make decisions using their rationality and their logic. The funny thing is, that they don’t. This is a study that is based around the idea that a dollar is only worth a dollar. We will talk about gambling, poker games and money in general. Money happens to be the foundation and engine of playing poker. This is what makes the game as big as it is and this is what makes the game full of psychology. This cannot simply be played without money although a game that is played for fun may appeal to younger generations. What do you think about the relationship between poker games and the player’s insight on money? Do you think that would be relevant in a study case for economists? The first thing to appreciate about money is how asymmetric it is and the subjective worth behind it. There is positivity and a negativity that comes with the winning and losing of money. The effects will show up when money is imaginary and people would feel that discomfort when they were simply asked about losing a significant amount of money. The implication in this article is that people who are avoiding risk are doing so, such as avoiding a poker game, because of the fear of being miserable due to that loss. We are all this way to a certain level but there are some people who find those losses to be the riskiest endeavor that they can take. It also isn’t difficult to find people who are not afraid of taking any risk, regardless of what that is. We all know the poker players and the sports better that will spend a ridiculous amount of money simply playing for the thrill of it all. Money is associated with psychology and we will spend money according to the way that our psychology is wired. The way that we have been conditioned plays a huge role in the risks that we take gambling as well as the way that we spend our money. Unless of course you are playing with “free money” or people favorite free spins on a casino. There are two elements to remember when using psychology to gamble or play poker games. You need to have a deep understanding of your own play style and also understand how others see the way that you play style. You can attempt to work out another person’s play style and then reveal this with your own strategic movies in beating them. Make sure that you do not reveal your own weaknesses in the process of revealing their game. IF you think about it, Poker is really psychology and playing against your opponents. 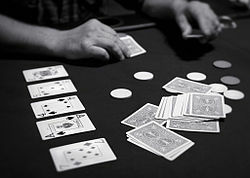 In many games, it will often end with a small hand such as a pair beating a smaller number. Remember, your hand doesn’t have to be a high hand for you to win. All that it has to be is better than the players who still have their cards in their hands. Being able to know what your opponents have can be a bit of an art and not a science. There are many successful players who have bodily signs that may give you a clue as to what your opponent has. You may be able to read those signs by mastering the psychology of poker games, although you should always get familiar with the elements of it before focusing on the skills. It boils down to your own ability in being able to watch how other opponents are playing and then use what you gain from that to judge the next players with the current hand that you’re playing. It’s always important that you do not become distracted from the game, do not watch television – even if it’s a friendly game. Even during a friendly game you can learn something from your friends or opponents, and the way that they play. A new, fun and exciting poker variation has been long awaited by the poker community and it seems that the Open Face Chinese is just what the players have been looking for. The game which emerged amongst the top poker pros in 2012 gained recognition rather fast and is now building up its muscles for a high flight in the poker industry. The main issue with Open Face Chinese was its lack of online presence. Major poker sites including PokerStars have declared they have looked into the opportunity of launching the game on their platform, but have decided not to go with it. This left the chance for the smaller gaming providers to cease the opportunity and launch the software before anyone else. And by the end of 2013, one of the best known personalities in the poker industry, Antanas “Tony G” Guoga has introduced the first global online poker site dedicated solely to Open Face Chinese Poker. The poker software was launched as part of Tony’s new online gaming franchise TonyBet and has quickly gained popularity amongst those who have been waiting for the game to go online. Although the site launched in its beta version, the software was received rather positively by the poker community and the company spokesmen said they saw the signup numbers grow fast. This came as no surprise as Tony, who is highly popular withing the poker society, was personally involved in spreading the word out through his blog and social media. Having almost no competition on the field was also a huge factor. Tonybet Poker is now available on all Operating systems and features an Android app. The site also offers all four game variations including Pineapple, Turbo, Classic and Regular. Although at the beginning they only had cash games, in time Tonybet Poker released SnG and MTT tournaments drawing players to the tables offering guaranteed freeroll prize pools. The game of Open Face Chinese itself appeared to have its own appeal – easy to learn and fun to play OFC is not difficult to learn, although mastering it may be harder than it looks at first. Many players seem to make the same mistake of deciding what hand’s they want to collect after receiving their first five cards and then leaving empty-handed when their initial plan fails. This just proves that there’s much more to Open Face Chinese than most players think. 888 Casino. This popular casino site often has a high position on the various best online casino list rankings compiled by various review sites. The biggest selling point of 888 Casino is undoubtedly the fact that they have their own proprietary software, which means that they offer games that can be found only on their site. In addition it is currently offering an extremely generous £88 no-deposit bonus that you can claim without having to make a deposit in a playing account and which lets you keep up to £20 worth of winnings. This is apart from its 100% first deposit matching bonus up to £100 or $200, which you only have to play 30x before you can withdraw it. The casino also holds regular promotions where you can win valuable prizes such as iPads and coffee makers. One of the biggest draws for players is 888’s line of slots games, including many progressive slots which could net you millions if you’re lucky. But apart from the slots, 888 also has the most popular table games including blackjack, baccarat and roulette as well as a sports book and bingo and poker rooms. Star games Casino. This popular casino site claims to have seven million players worldwide and their popularity should not be surprising given that they offer support for multiple languages as well as having a wide variety of exciting games. In order to attract new players, Stargames offers a generous 50% matching bonus on first deposits, up to €100. All new players are also automatically signed up for the site’s bonus program and are given entry-level Bronze status as well as 5,000 stars that can be used to play games on the site. You can earn more stars and bonus points that will help you go up to higher status levels like Silver, Gold, Platinum and Diamond as you play more games on the site. Having a higher member status entitles you to many privileges such as faster withdrawal processing and quicker crediting of loyalty points. In addition, Stargames allows new players to play for free simply by registering for an account at their site. New members are automatically given 500 stars upon sign up, which they can use to play free games at once. For every day they log in and play games, they are given an additional 500 stars. Royal Vegas. This popular online casino has been active since 2000, and has developed a reputation as one of the best gaming sites. It is also one of the online casinos under the Fortune Lounge Group, which has continuously been working to provide players with the best Internet gaming experience. To entice new members to sign up, Royal Vegas is currently offering a deposit match bonus of up to 1,200 in dollars, euro or pounds on their first five deposits, which are cashable. The site offers blackjack, baccarat, craps and slots. In addition, the Royal Vegas site is powered by Microgaming software, which means that it offers many progressive jackpots. If you’re lucky enough to hit one of these jackpots, you can walk away with millions of euro as your prize. Outstanding players may also qualify to play in the International Blackjack League and the International Slots League, which offer valuable prizes. To play at Royal Vegas you have to download their software but you have several options to do so. You can download the whole program, which includes 40-plus games or you can download a smaller version with three pre-loaded games and then download the games that you want. There are also several games that have flash versions which you can play without downloading. Spin Palace Casino. This gaming site has become popular with players from all over the world, including Europe, the Americas, Asia and Australasia, due to its wide variety of games. Founded in 2001, the Spin Palace has more than 400 games in its library, ranging from slots and video poker, to card games like blackjack and poker, and, of course, roulette. The site is powered by Microgaming software, which gives online players a very lifelike casino experience, with realistic graphics and sound effects. The site boasts of an average payout ratio of 97 percent. Registered members also have the privilege of participating in slots tournaments with no entry fee but which have a variety of real money prizes. New players can avail of a welcome bonus worth $1,000, including a 100% first-deposit matching bonus of up to $150 plus 25% match on the second deposit and 50% on the third. There are also random $50 bonuses that you can avail of. The bonuses have a 30x playable requirement, meaning that you have to play the amount of the bonus thirty times before you can cash it out. Jackpot City. This site earns a spot on the best online casino list ratings for having the highest slot payouts. Their slogan is “Home to the Biggest Jackpots” and they claim to have an average payout of 97.4 percent. Their slot games include the mega-progressive Mega Moolah and Major Millions. In addition, Jackpot City is part of a network of sixty casinos that aggregate money into a huge pot that is known as Jackpot Madness. Thus, it should not be surprising that they have earned a coveted seal of approval from eCOGRA, a non-profit independent organization that ensures the protection of online players by ensuring fair gaming. In addition to slots, Jackpot City also offers an assortment of casino games, including video poker, blackjack, All-Aces Poker, Keno as well as virtual scratch cards. New players who register for an account at Jackpot City are entitled to a 100% matching bonus of up to $200, as well as a second-deposit 100% matching bonus of up to $300 and a comp points program where players earn points whenever they make a bet, which can be exchanged for casino credits. However, only the winnings from the bonus are cashable but not the bonus itself. There is also a 50X wagering requirement, which means you have to play the bonus fifty times before you can cash-out your winnings. You think it’s an easy questions, don’t you? It sounds easy enough. However, I don’t think it’s that easy. At least, if winning is in your head. This post will be a little different but I hope that you’ll find it quite entertaining. How do you play poker? Let’s start with the basics. Even though the rules of Texas Hold’em are the same, you don’t play the same way every day. Maybe you would the best and the worst play starting hands the same way most of the time pre-flop like raising and 3-betting high pocket pairs and always folding garbage hands like 72o and 83o. But that’s pretty much it. There are major differences in the way you would play in a cash game and in a tournament. Moreover, you (should) play differently when you play in a live tournament like WSOP or online, like 888Poker that I currently use to satisfy my online poker needs. And just think about the variety of your opponents and the way you could play, let’s say a nut flush draw against. You could check-call, check-raise, lead while sometimes you just fold and feel good about it. There are also differences between different games, different stakes. How to play poker on 888Poker? I’d like to think of myself as a semi-intermediate poker player. I’m not a beginner anymore. I know the rules, some plays to make. But of course, I have plenty of leaks like cbetting too much, calling too much on turn and on the river, etc. That’s why I love so 888Poker so much. They’ve got a special program that launches and runs along with their poker software. It’s called 888Poker Couch and what it does it shows you how to play poker well by showing you your cards, your outs and odds and suggestions on what can you should do. 888 Poker Couch taught me to assess the strength of my hand much quicker and learn counting pot odds easier. And improve in terms of discipline because while I was starting out, I would constantly open much wider than I should. 888Poker coach constantly tells me whether I should fold and surprisingly, I do. I know that once I improve my fundamentals I will be able to open more based on who is sitting on my left and right but for now I’m happy just to listen to a program that helps me play. By the way, if you open more than one table, poker coach will run along each of the tables. How do you play poker is a multi-dimensional question. I love it because there are ten ways you can answer it. And neither of which would still be right. It’s just poker is such a versatile game. And if you want to go even further, think about the variations of poker beyond today’s most popular Texas Hold’em. How to start playing online poker? When starting out, you need a bankroll. After all, you play for real money. If you really don’t have any means how to make a deposit, you can always start with play-money games and real money freerolls. It’s a long and hard way to start because there are so many players that enter these free games but on the upside, you don’t risk anything. If you can make a deposit, your journey becomes much easier because of all the choices you get. You can start with cash games, micro Sit and Go’s and tournaments. You can play satellites to enter bigger tournaments. This has a few advantages including an opportunity to win much more than your regular games offer as well as play against against much better opponents. And I know what are you going to say ”nobody wants to play against tougher opponents”. And I agree but the thing is, you can’t learn from beginners. Maybe playing against players with less poker skills may build your bankroll quicker but you only improve by learning from better players. Imagine, you tell your non-poker playing friend that you play poker. And he asks you “how do you pay poker”? What’s the first thing you say? You say that it’s a card game with two hole cards and five community cards? You tell him all about poker being deceptive game that requires a special set of skills? Do you talk about your own playing style? You see, that’s what I have been talking about in this post. There are so many dimensions in this game it’s amazing! Due to the extreme popularity of bitcoins, it is not surprising to learn that poker players are also getting interested with the digital currency. In fact, there are some online poker sites which had recently launched the use of bitcoins in their playrooms. To use bitcoins, an online poker player must have an eWallet to be able to transfer money to and from the online poker site. In most cases, online sites can process bitcoin deposits instantaneously while cashouts are processed in less than 12 hours. Some poker articles also say that there are some poker sites which can even process withdrawals in an hour. Poker players can opt for bitcoins because it takes less time to process bitcoin transactions. The bitcoin withdrawal process requires that the poker player initiates the withdrawal request to notify the poker site’s administrative team. The admin group will verify the account and transfer the bitcoins to the bitcoin address of the player. Traditional poker sites can take 2 days to process a cashout due to the security policy instituted by these companies. These sites also require only one cashout request at any given time. However, with bitcoins, players can make multiple cashout requests. Also, there are traditional poker sites which cap the withdrawal at an amount not more than the player’s original deposit. In cases when the player decides to withdraw more than his initial deposit, he has to wait at least 72 hours. For direct bank transfers, it takes at least 72 hours and at most 5 banking days for the money to be deposited to the player’s bank account. Most traditional online poker sites require personal information, especially when depositing and withdrawing cash. However, for online poker sites accepting bitcoins, there is no need for players to provide personal information. According to poker articles, they can play and transact using bitcoins without the need for documentation. However, there are online poker sites that accept bitcoins and still require players to provide personal information because transparency is important for these sites. Most states in the United States of America have their own laws with regards to online poker. A lot of these states restrict players from playing with everyone outside their state. Since bitcoins are not yet regulated in the USA, US poker players can play with other players from different countries. The value of the bitcoin fluctuates like a commodity or a share of stock. As such, poker players who use bitcoins can benefit from such fluctuations. The value can jump dramatically therefore the poker player not only gains from the play itself but from the fluctuations of the bitcoin’s value as well. Depending on a lot of factors, the value of the bitcoin can also make a dramatic drop anytime. Therefore, for poker players, it is best to buy bitcoins when they are inexpensive. Online poker sites which accept bitcoins offer 20% player rakebacks. Some sites offer 50%. These poker sites allow players to choose from different sign-up incentives. The rakeback is often credited to the player’s account on schedule. There are poker player pools with players who are less-skilled. Online poker sites which accept bitcoins have smaller pools because the digital currency is relatively new. However, there are also skilled players in these sites but casual players thrive in smaller poker pools. Bitcoin is a cryptocurrency. It is a digital currency unlike any traditional currency like the pound, euro, or dollar. Aside from being a virtual currency, it is also treated as a financial instrument like a commodity, bond, or share of stock. The bitcoin isn’t regulated by any government or bank. It is created not by a central bank but by a computer program. It doesn’t backup any economic activity of any country. Furthermore, the bitcoin has a cash value so bitcoin owners can exchange it with any traditional currency through the system’s eWallet. The bitcoin is created through an open-source platform using a peer-to-peer computer network. It can be created by anyone who has the technical understanding of encryption codes. Programmers who create bitcoins are rewarded with bitcoins. For this new digital currency to thrive, the public is encouraged to use it. A block chain is a bitcoin public ledger where all transactions are entered. It makes use of difficult mathematical equations to verify each transaction’s validity. Digital signatures protect every transaction’s authencity. With this system, there is no need for any financial institution or bank to control the bitcoin transactions. Although the bitcoin isn’t endorsed by central banks, Germany has allowed the use of bitcoins in private transactions so that bitcoin creators and users can be taxed. Texas Judge Amos Mazzant declared bitcoin as a form of money in his landmark decision on the Trendon Shavers case. Bloomberg also provided an experimental ticker for bitcoin. In New York, the Department of Financial Services invited different virtual currency firms and users to shed light on the bitcoin issues in order to create regulations for the users’ protection. In the United Kingdom, bitcoin companies, finance houses, and small banks pushed for the regulation and recognition of the cryptocurrency. Although bitcoin isn’t regulated and currently not globally accepted, it is being used by different online poker sites outside of the United States of America. This new digital currency allows even US players to play with other players around the world. The use of bitcoins in online poker sites does pose a lot of questions, especially with regards to the safety and security of using the new virtual currency. The public may feel confused because it seems only businesses, speculators, and the tech community understand it. However, the bitcoin may be accepted globally soon because there are a lot of entities pushing for its adoption and recognition. Online poker is now becoming more popular than real poker. Millions of people from all over the world now prefer playing poker online. 888 Poker is currently one of the best places to play poker online. Thousands of players play online poker 24/7, so there is no shortage of people to play with. This poker room has a lot to offer this year to both old and new players. 888 is offering new promotions, bonuses, updated software, and more. The new promotions are really worth mentioning because they offer better bonuses and promotions than most online poker sites. New bonuses and promotions have helped cement 888’s position as one of the best sites for online poker and other casino games. A new sign up bonus for the year. Players who sign up on their website for the first time will receive more than a deposit bonus.If the user chooses to sign up directly at the 888Poker website, he will receive a very nice welcome package. Welcome package includes a 100% up to $400 welcome bonus, free entry to the $100K First Depositors’ Challenge, and free seats to the First Depositors’ Freeroll. New users can receive other special bonuses by clicking on special links provided by existing users of 888 Poker. By signing up using the special link (known as the “Invite-a-Friend” link,”) new players get $8 free on their account and a free seat in the $1,000 Invite-A-Friend Poker Freeroll. New users can get all of these special bonuses regardless of how much they deposit. It is possible to turn a $20 deposit into thousands of dollars by playing in tournaments held for new depositors. It seems that 888’s goal for the year is to attract and create a better experience for new players. For new players, 888 Poker is offering 3 freeroll tickets to the $2.5 million SUPER XL Series online event. The SUPER XL Series is biggest online event for the year. Only the top 100 players of each of the daily freerolls will be able to participate in the main event. Players do not need to make deposits in this event. 888Poker is also offering a “Double Your Money!” promotion that is very helpful for new users. This promo doubles the first deposit of a new user. For instance, if a new user deposits $20 for the first time, he gets an extra $20 in his account for free. If he deposits $100 as his first deposit, he gets an extra $100 for free. This promo is perfect for new users because it provides them with extra cash for playing Teams poker games, low buy-in tournaments, and more. A new user can receive up to $400 extra cash with this promo. The Shane’s Poker Paradise is also one of special promotions for the year. This promo gives poker players a chance to enter the famous Shane Warne Poker Classic tournament in Hertfordshire, UK. The grand prize is a $1,250 package that includes one night at the Grove Hotel & Golf Club, $200 for travel expenses, $250 entry for the upcoming Shane Warne Poker Classic tournament, buffet dinner, drink vouchers, and more. To win the grand prize, users can play their way to the Qualifier via freerolls or satellites. Players can also secure their place in the celebrity event by paying $1,250 directly. The Whale is a poker tournament that gives both old and new users a chance to win a share of the $250,000 prize. The tournament features a $250,000 guaranteed prize pool and users can play their way into the tournament through satellites starting from only 10 cents. They can also choose to go straight to The Whale tournament that takes place every Sunday at 19:00 GMT. The buy-in for The Whale tournament is $530. Existing users are rewarded whenever they invite their friend to play online poker. Users can invite their friends using a special link or via email. When a friend signs up and makes a deposit, both the user and his friend will receive $8 free on their accounts. They also get a free seat in the $1,000 Invite-A-Friend Poker Freeroll. Invited users will also get welcome package and bonuses when they sign up using their friend’s link and make their first deposit. 888 Poker is offering other promotions for the year that are not as huge as the special promotions mentioned above. They have ongoing promotions such as the Teams Poker tournaments, $100K Sunday Challenge, $10K Monday Twins Challenge, $1K Depositors’ Freeroll, $1K Free Casino Mix-Up, and Video Poker tournament. These promotions help keep players entertained and give them something to look forward to each week. They also reward its loyal users with Status and Reward Points. These points are earned by simply playing poker games online. Users can spend their points at Online Shop to purchase goodies such as iPads, branded hoodies, and holiday packages. 888 Poker adds new items on the online shop from time to time, so there is always a reason for existing users to save up their points. These new promotions make 888 Poker one of the best online poker sites on the internet today. It does not only reward new users for signing up, but also reward existing users with reward points, weekly tournaments, and referral bonuses.